On March 20th this year, the moon will pass between Earth and the Sun sending a slither of Northern Europe into darkness. For those in the UK, this partial eclipse will be the most impressive eclipse until three minutes of totality at 4:56pm on September 23rd, 2090. Calculating something so far ahead seems like an impressive feat but in fact astronomers can precisely work out exactly when and where eclipses will occur for not just the next hundred, but the next million years. Such is the way for most transiting exoplanets too, the calculations for which could probably be valid in thousands of years. But a new planetary system, discovered by a team that includes Warwick astronomers (including me), doesn’t yet play by these rules. 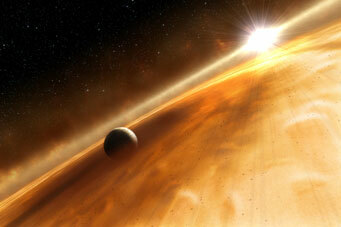 It consists of two planets orbiting their star, a late K star smaller than our sun, in periods of 7.9 and 11.9 days. The pair have radii 7- and 4-larger than Earth, putting them both between the sizes of Uranus and Saturn. They are the 4th and 5th planets to be confirmed in data from K2, the rejuvenated Kepler mission that monitors tens of thousands of stars looking for exoplanetary transits. (36 other planet candidates, including KIC201505350b & c, have been released previously). But it is their orbits, rather than planetary characteristics, that have astronomers most excited. “The periods are almost exactly in a ratio of 1.5” explains Dave Armstrong, lead author of the study. This can be seen directly in how the star’s brightness changes over time. This lightcurve appears to have three dips of different depths, marked here by green, red and purple dips. ”Once every three orbits of the inner planet and two orbits of the outer planet, they transit at the same time”, causing the deep purple transits. But this doesn’t just make for an interesting lightcurve; the closeness of these periods to a 3/2 ratio also causes other weird effects. “The planets perturb each other and change their period every orbit, so they never quite transit when you expect”, explains Arms. These shifts are called Transit Timing Variations (or TTVs). The size of these TTVs is related to the mass of the planets, and some previous multi-planet systems have been weighed in this way. When the team went back to observe the larger planet less than 9 months later, they found that the transit time had shifted by more than an hour. And their period ratio of 1.5035 means the resulting TTVs are likely to continue increasing over a few years, potentially shifting the system more than a day from it’s current rhythm. These TTVs also help prove that the planets are real. Their presence means that both objects are interacting with each other, so the planets must orbit the same star rather than being, say, two different background binaries. The team also used these shifts in transit time to constrain the planet masses, showing them to be less than 1.2 and 2.04 times that of Jupiter. Not only is this one of the most interesting multi-planet systems yet discovered by Kepler, it is also one of the brightest (12th magnitude), making ground-based follow-up much easier than many Kepler systems. Most interestingly, precise spectrographs like HARPS and SOPHIE will be able to measure the tiny to-and-fro shift in the star’s velocity caused by the gravitation pull of planet on the star. This radial velocity would give a precise mass for the planets in the system and for the first time allow masses found by TTVs to be directly compared to those from RVs. Examples of 3:2 resonance can be found everywhere in planetary science, including between Pluto & Neptune’s orbits, in the Kirkwood gap of the Asteroid Belt, and even between the planets around pulsar PSR1257+12. It is also thought that Jupiter and Saturn may have, at one point, become caught in a 3:2 resonance as they migrated inwards. This scenario, of planets caught in 3:2 resonance migrating inwards, could explain how these two sub-Jupiter sized planets came to be in such an unusual orbit. 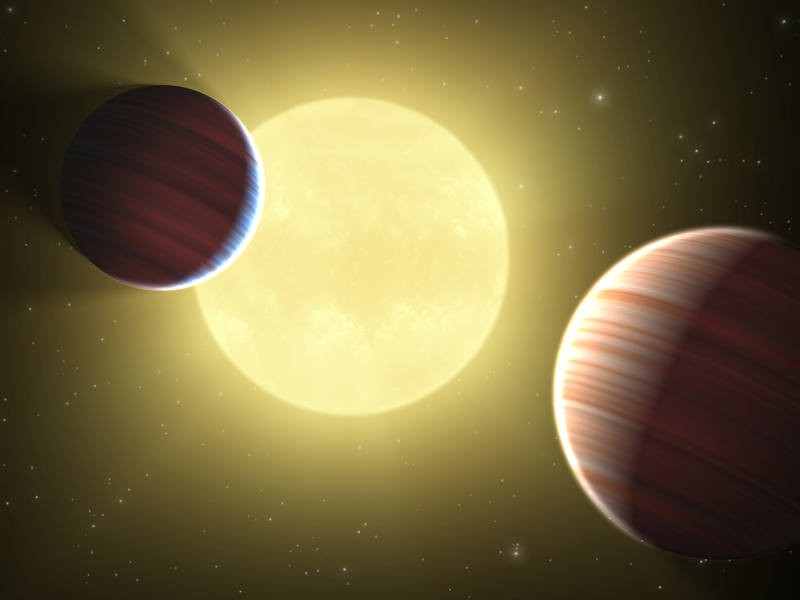 These two planets could also help settle other dilemmas. “We’d like to answer questions like ‘Did they form there?’, ‘Did they migrate there and get stuck?’ and ‘will they eventually get ejected from the system, or crash into the star?’” suggests Armstrong. The best way to do this is simply by watching future transits and monitoring just how in-sync the planets really are. And maybe one day we could even begin to predict their eclipses as confidently as we can with those happening here on Earth. The paper, submitted to A&A, can be found on ArXiV here. My work on the paper involved developing the tools to find the transiting planets in the K2 lightcurve.